Referred to in the Talmud. Decorative "crowns" which are sometimes placed on the letters of the Hebrew alphabet. The taga is regularly composed of three flourishes or strokes, each of which resembles a small "zayin" and is called "ziyyun" ( = "armor," i.e., "dagger"). In the New Testament the taga is called "tittle" (Matt. v. 18). The seven letters צ, ג, ו, נ, ט ע, ש have the crowns on the points of the upper horizontal bars. The flourishes are placed on the tops of the letters, and they are found only in the Scroll of the Law, not in the printed copies of the Pentateuch. The tagin are a part of the Masorah. According to tradition, there existed a manual, known as "Sefer ha-Tagin," of the tagin as they appeared on the twelve stones that Joshua set up in the Jordan, and later erected in Gilgal (Josh. iv. 9, 20). On these stones were inscribed the books of Moses, with the tagin in the required letters (Naḥmanides on Deut. xxvii. 8). The baraita of "Sefer ha-Tagin" thus relates its history: "It was found by the high priest Eli, who delivered it to the prophet Samuel, from whom it passed to Palti the son of Laish, to Ahithophel, to the prophet Ahijah the Shilonite, to Elijah, to Elisha, to Jehoiada the priest, and to the Prophets, who buried it under the threshold of the Temple. It was removed to Babylon in the time of King Jehoiachin by the prophet Ezekiel. Ezra brought it back to Jerusalem in the time of Cyrus. Then it came into the possession of Menahem, and from him was handed down to R. Neḥunya ben ha-Ḳanah, through whom it went to R. Eleazar ben 'Arak, R. Joshua, R. Akiba, R. Judah, R. Miyasha ( ), R. Nahum ha-Lablar, and Rab." The Aramaic language and the Masoretic style of the "Sefer ha-Tagin" would fix the time of its author as the geonic period. But the frequent references in the Talmud to the tagin suggest the probability of the existence of "Sefer ha-Tagin" at a much earlier period. Raba said the seven letters צ, ג, ו, נ, ט, ע, ש must each have a taga of three daggers (Men. 29b). The letter ה likewise has a taga (ib.). The taga of the ד is also referred to (Soṭah 20a). The taga of the "ḳof" is turned toward the "resh" (Shab. 104a; 'Er. 13a). 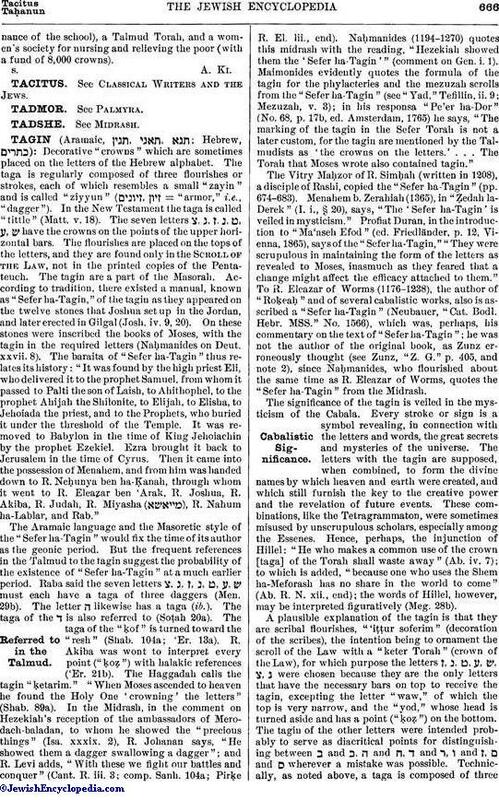 R. Akiba was wont to interpret every point ("ḳoẓ") with halakic references ('Er. 21b). The Haggadah calls the tagin "ḳetarim." "When Moses ascended to heaven he found the Holy One 'crowning' the letters" (Shab. 89a). In the Midrash, in the comment on Hezekiah's reception of the ambassadors of Merodach-baladan, to whom he showed the "precious things" (Isa. xxxix. 2), R. Johanan says, "He showed them a dagger swallowing a dagger"; and R. Levi adds, "With these we fight our battles and conquer" (Cant. R. iii. 3; comp. Sanh. 104a; Pirḳe R. El. lii., end). Naḥmanides (1194-1270) quotes this midrash with the reading, "Hezekiah showed them the 'Sefer ha-Tagin'" (comment on Gen. i. 1). Maimonides evidently quotes the formula of the tagin for the phylacteries and the mezuzah scrolls from the "Sefer ha-Tagin" (see "Yad," Tefillin, ii. 9; Mezuzah, v. 3); in his responsa "Pe'er ha-Dor" (No. 68, p. 17b, ed. Amsterdam, 1765) he says, "The marking of the tagin in the Sefer Torah is not a later custom, for the tagin are mentioned by the Talmudists as 'the crowns on the letters.' . . . The Torah that Moses wrote also contained tagin." The Vitry Maḥzor of R. Simḥah (written in 1208), a disciple of Rashi, copied the "Sefer ha-Tagin" (pp. 674-683). Menahem b. Zerahiah (1365), in "Ẓedah la-Derek" (I. i., § 20), says, "The 'Sefer ha-Tagin' is veiled in mysticism." Profiat Duran, in the introduction to "Ma'asch Efod" (ed. 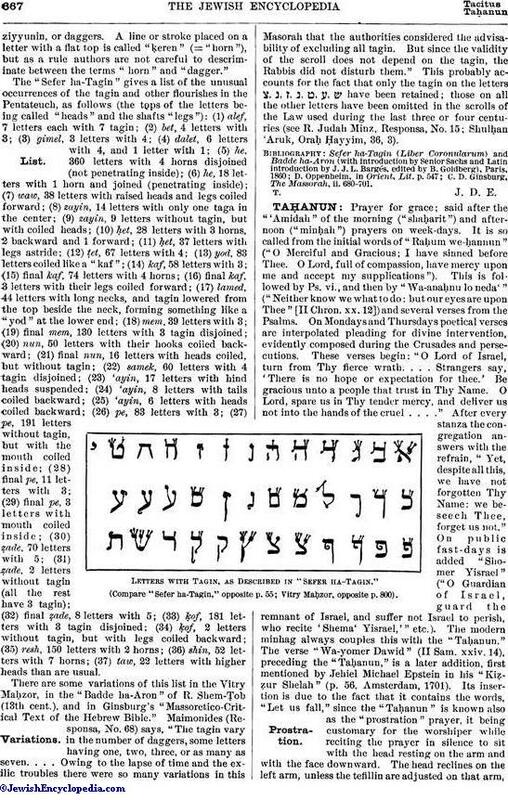 Friedländer, p. 12, Vienna, 1865), says of the "Sefer ha-Tagin," "They were scrupulous in maintaining the form of the letters as revealed to Moses, inasmuch as they feared that a change might affect the efficacy attached to them." To R. Eleazar of Worms (1176-1238), the author of "Roḳeaḥ" and of several cabalistic works, also is asscribed a "Sefer ha-Tagin" (Neubauer, "Cat. Bodl. Hebr. MSS." No. 1566), which was, perhaps, his commentary on the text of "Sefer ha-Tagin"; he was not the author of the original book, as Zunz erroneously thought (see Zunz, "Z. G." p. 405, and note 2), since Naḥmanides, who flourished about the same time as R. Eleazar of Worms, quotes the "Sefer ha-Tagin" from the Midrash. The significance of the tagin is veiled in the mysticism of the Cabala. Every stroke or sign is a symbol revealing, in connection with the letters and words, the great secrets and mysteries of the universe. The letters with the tagin are supposed, when combined, to form the divine names by which heaven and earth were created, and which still furnish the key to the creative power and the revelation of future events. These combinations, like the Tetragrammaton, were sometimes misused by unscrupulous scholars, especially among the Essenes. Hence, perhaps, the injunction of Hillel: "He who makes a common use of the crown [taga] of the Torah shall waste away" (Ab. iv. 7); to which is added, "because one who uses the Shem ha-Meforash has no share in the world to come" (Ab. R. N. xii., end); the words of Hillel, however, may be interpreted figuratively (Meg. 28b). A plausible explanation of the tagin is that they are scribal flourishes, "'iṭṭur soferim" (decoration of the scribes), the intention being to ornament the scroll of the Law with a "keter Torah" (crown of the Law), for which purpose the letters ו, ג, ט, ע, ש, צ, ג were chosen because they are the only letters that have the necessary bars on top to receive the tagin, excepting the letter "waw," of which the top is very narrow, and the "yod," whose head is turned aside and has a point ("ḳoẓ") on the bottom. The tagin of the other letters were intended probably to serve as diacritical points for distinguishing between ב and ב, ח and ח, ך and ך, ו and ו, ם and מ wherever a mistake was possible. Technically, as noted above, a taga is composed of threeziyyunin, or daggers. A line or stroke placed on a letter with a flat top is called "ḳeren" (= "horn"), but as a rule authors are not careful to descriminate between the terms "horn" and "dagger." The "Sefer ha-Tagin" gives a list of the unusual occurrences of the tagin and other flourishes in the Pentateuch, as follows (the tops of the letters being called "heads" and the shafts "legs"): (1) alef, 7 letters each with 7 tagin; (2) bet, 4 letters with 3; (3) gimel, 3 letters with 4; (4) dalet, 6 letters with 4, and 1 letter with 1; (5) he, 360 letters with 4 horns disjoined (not penetrating inside); (6) he, 18 letters with 1 horn and joined (penetrating inside); (7) waw, 38 letters with raised heads and legs coiled forward; (8) zayin, 14 letters with only one taga in the center; (9) zayin, 9 letters without tagin, but with coiled heads; (10) ḥet, 28 letters with 3 horns, 2 backward and 1 forward; (11) ḥet, 37 letters with legs astride; (12) ṭet, 67 letters with 4; (13) yod. 83 letters coiled like a "kaf"; (14) kaf, 58 letters with 3; (15) final kaf, 74 letters with 4 horns; (16) final kaf, 3 letters with their legs coiled forward; (17) lamed, 44 letters with long necks, and tagin lowered from the top beside the neck, forming something like a "yod" at the lower end; (18) mem, 39 letters with 3; (19) final mem, 130 letters with 3 tagin disjoined; (20) nun, 50 letters with their hooks coiled backward; (21) final nun, 16 letters with heads coiled, but without tagin; (22) samek; 60 letters with 4 tagin disjoined; (23) 'ayin, 17 letters with hind heads suspended; (24) 'ayin, 8 letters with tails coiled backward; (25) 'ayin, 6 letters with heads coiled backward; (26) pe, 83 letters with 3; (27) pe, 191 letters without tagin, but with the mouth coiled inside; (28) final pe, 11 letters with 3; (29) final pe, 3 letters with mouth coiled inside; (30) ẓade, 70 letters with 5; (31) ẓade, 2 letters without tagin (all the rest have 3 tagin); (32) final ẓade, 8 letters with 5; (33) ḳof, 181 letters with 3 tagin disjoined; (34) ḳof, 2 letters without tagin, but with legs coiled backward; (35) resh, 150 letters with 2 horns; (36) shin, 52 letters with 7 horns; (37) taw, 22 letters with higher heads than are usual. There are some variations of this list in the Vitry Maḥzor, in the "Badde ha-Aron" of R. Shem-Ṭob (13th cent. ), and in Ginsburg's "Massoretico-Critical Text of the Hebrew Bible." Maimonides (Responsa, No. 68) says, "The tagin vary in the number of daggers, some letters having one, two, three, or as many as seven. . . . Owing to the lapse of time and the exilic troubles there were so many variations in this Masorah that the authorities considered the advisability of excluding all tagin. But since the validity of the scroll does not depend on the tagin, the Rabbis did not disturb them." This probably accounts for the fact that only the tagin on the letters צ, ג, ו, ג, ט, ע, ש have been retained; those on all the other letters have been omitted in the scrolls of the Law used during the last three or four centuries (see R. Judah Minz, Responsa, No. 15; Shulḥan 'Aruk, Oraḥ Ḥayyim, 36, 3). C. D. Ginsburg, The Massorah, ii. 680-701.